Do you spend a lot of time communicating? Or trying to communicate? Maybe it’s time to pay attention to your non-verbal communication. Non-verbal communication is usually understood as the process of communication through sending and receiving wordless (mostly visual) cues between people. Messages can be communicated through gestures and touch, by body language or posture, by facial expression and eye contact. 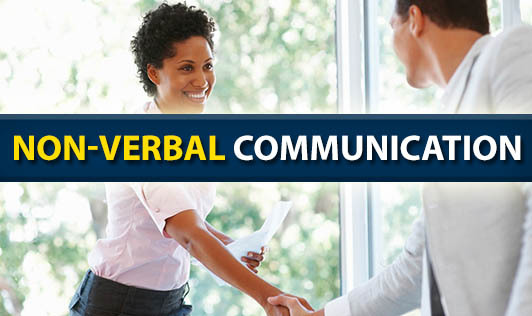 Most psychologists will tell you that nonverbal communication makes up about two-thirds of all communication between two people or between one speaker and a group of listeners. 2. Gestures: - Deliberate movements and signals are an important way to communicate meaning without words. Common gestures include waving, pointing, and using fingers to indicate numeric amounts. Other gestures are arbitrary and related to culture. 3. Paralinguistic: - Paralinguistic refers to vocal communication that is separate from actual language. This includes factors such as tone of voice, loudness, inflection and pitch. Consider the powerful effect that tone of voice can have on the meaning of a sentence. When said in a strong tone of voice, listeners might interpret approval and enthusiasm. The same words said in a hesitant tone of voice might convey disapproval and a lack of interest. 4. Body Language and Posture: - Posture and movement can also convey a great deal on information. Research on body language has grown significantly since the 1970’s, but popular media have focused on the over-interpretation of defensive postures, arm-crossing, and leg-crossing.These nonverbal behaviors can indicate feelings and attitudes. 5. Proxemics: - People often refer to their need for ’personal space,’ which is also an important type of nonverbal communication. The amount of distance we need and the amount of space we perceive as belonging to us is influenced by a number of factors including social norms, situational factors, personality characteristics and level of familiarity. 6. Eye Gaze: - Looking, staring and blinking can also be important nonverbal behaviors. When people encounter people or things that they like, the rate of blinking increases and pupils dilate. Looking at another person can indicate a range of emotions, including hostility, interest and attraction. 7. Haptics: - Communicating through touch is another important nonverbal behavior. There has been a substantial amount of research on the importance of touch in infancy and early childhood. Touch can be used to communicate affection, familiarity, sympathy and other emotions. 8. Appearance: - Our choice of color, clothing, hairstyles and other factors affecting appearance are also considered a means of nonverbal communication. Appearance can also alter physiological reactions, judgments and interpretations. Just think of all the subtle judgments you quickly make about someone based on his or her appearance. These first impressions are important, which is why experts suggest that job seekers dress appropriately for interviews with potential employers. 10. Silence: - Like other types of non-verbal communication a complete silence also can transmit out inner view of mind. Both positive and negative attitude can be expressed through silence.